In a wireless packet (ATM) network that supports an integrated mix of multimedia traffic, a large variety of mobiles with different service rates will need to be accommodated efficiently in a unified bandwidth-on-demand fair-sharing manner. 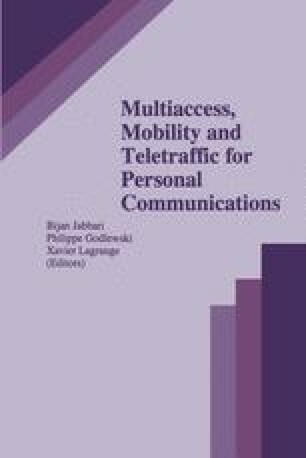 In this paper, we propose and study a Time-Frequency Slicing with Distributed-Queueing Request Update Multiple Access (DQRUMA) protocol for wireless packet (ATM) networks that support mixes of multi-rate traffics. The protocol incorporates Time-Frequency Slicing (an efficient multiplexing scheme for providing multi-rate packet transmissions) and DQRUMA (an efficient demand-assignment multiple access protocol for wireless access and scheduling) to form a unified bandwidth-on-demand platform for multi-rate wireless services. A slot-by-slot packet transmit scheduling policy named Bandwidth-on-Demand Fair-Sharing Round-Robin (BoD-FSRR) shares the system bandwidth amongst different rate classes of mobiles according to their demand on a fair-sharing basis. Simulation results show that the system provides close to ideal access performance for different rate classes of mobiles.